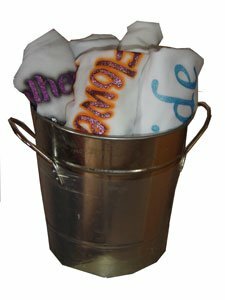 SPARKELIZE IS THE ONLY SITE THAT OFFERS BRIDES SUCH A GREAT DEAL.ﾠ YOU GET 5 SHIRTS FOR $100.00.ﾠ WE THROW IN A FREE SHIRT---GIVING YOU 6 SHIRTS FOR $100.00.ﾠ YOU CAN INTERCHANGE THE NAMES NECESSARY. WE GIVE YOU THE CHOICES BELOW. IF YOU WANT A REGULAR BRIDAL BUCKET JUSTﾠCALL US AND ASK FOR THE REGULAR, GIVE US YOUR SIZES AND YOUR COLOR CHOICE AND WE WILL GET IT RIGHT OUT TO YOU.ﾠTHE REGULAR BRIDAL BUCKET COMES WITH 1 EACH OF THE FOLLOWING: BRIDE, MOTHER OF THE BRIDE, MOTHER OF THE GROOM, MAID OR MATRON OF HONOR, FLOWER GIRL.ﾠ IF YOU NEED A BRIDE SHIRT AND MAID OF HONOR AND THE REST BRIDESMAIDS, WE WILL DO THAT TOO. WHATEVER YOU WANT!ﾠ IT IS YOUR DAY.ﾠ WHAT A WAY TO THANK YOUR GIRLS!ﾠ THESE ARE OUR HOTTEST SELLING ITEM. YOU CAN'T BEAT THE DEAL! CALL US NOW!!! !